- 3.2% AER variable with Santander. Forget to switch in 12 months to the new highest rate bank and this becomes 0.5%. - 3.17% AER with the Post Office. Forget about this one and in 12 months you’re at 1.65%. - 3.1% AER with the Nottingham Building Society. This one works a bit differently. If you close the account before the 30 September 2013 you only get 1% and after this date you also only get 1%. Of course banks like Santander, rely on the vast majority of the Average Joe’s and Jane’s out there forgetting to switch after 12 months, at which point you’re quickly penalised. Let’s say you start one of these savings accounts but then get distracted and only remember to switch to the new best offering in 15 months. That 3.2% which looked ok has now become effectively 2.7%. Leave it 18 months and you’re now at an effective rate of 2.3%. The alternative is to go for a no nonsense savings account. Today, again according to Money Saving Expert, that looks to be 2.75% variable with Aldermore (as long you have a balance over £1,000). So, stay with Santander for 15 months and you are worse off than this account. If you’re saving into one of these types of account let us now look at what is really happening to your savings. 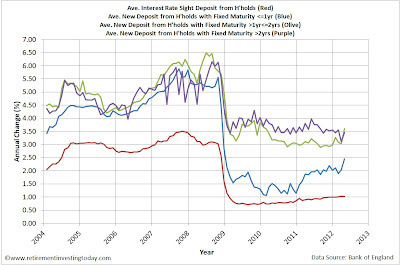 Let’s use the most bullish savings interest rate of 3.2% to give the most positive spin. Firstly, if you’re a UK basic rate taxpayer the government takes its tax cut leaving you with 2.56% and if you’re a UK higher rate taxpayer it’s even worse news with you only retaining 1.92%. Then you must consider the devaluation of your savings through inflation. Let’s assume the Retail Prices Index stays at its current year on year change of 3.46%. This would result in the basic taxpayers savings buying 0.9% less than they would have had you spent your savings today. As higher rate tax payer you’re worse off with the ability to buy 1.54% less than today in 12 months. We must then remember that these are the best accounts out there and even with those you are going backwards. My chart today shows what is happening to the Average Joe. The good news is that while it’s in extremely slow motion there does seem to be an upward shift in average savings accounts. 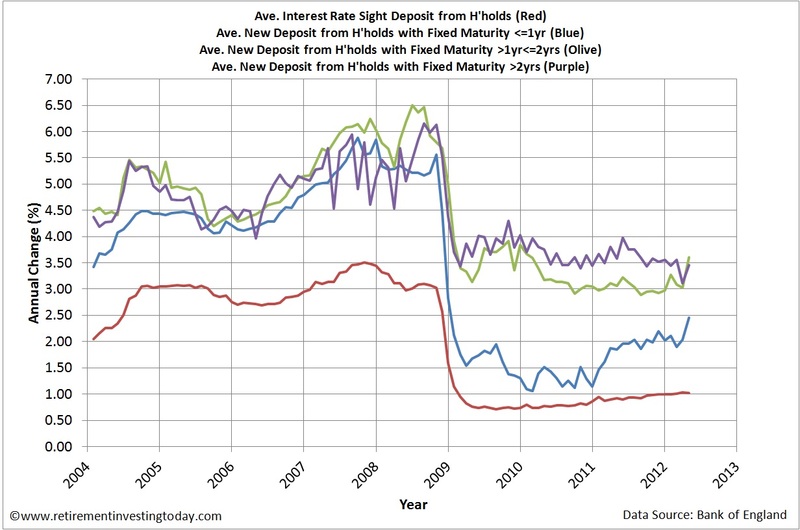 Interest bearing site sight deposits from households (the red line) have risen to 1.02% from a low of 0.71% in August 2009. Let’s think about Average Joe for a minute. He’s a basic rate taxpayer meaning his sterling savings will buy 2.6% less than today in only a year. - NS&I Index Linked Savings Certificates. Regular readers will now I am a big fan of these however unfortunately they are currently not on sale. While they were on sale I backed the truck up and so now hold about 20% of my total portfolio in them. I estimate that today they are yielding 4.2% tax free. This at least means instead of going backwards these funds are increasing at the rate of 0.74% in real terms. - I hold some cash in offshore accounts currently earning 4%, meaning I am getting more than the best UK rate. Of course this account comes with a wealth warning associated with currency exchange rates. It is possible that if the exchange rate goes against me I would lose purchasing power when priced in Sterling. Great info. Thank you so much for sharing your research. I tend to use my sipp when I want to go into cash or bonds. That way the interest is tax-free. I have recently taken a much keener interest in my investments and currently favour a mix of passive investment with some market timing thrown in. I moved out of gilts recently as I was worried that the premium was too high, although I must confess that I haven't investigated the price drivers of gilts sufficiently to understand them. At the moment I favour residential property for a steady long term income and inflation hedging. I then favour using the vanguard lifestyle funds, varying the mix of bonds and equities depending on how confident I feel in the market. I value your pe10 stats as I favour judging the long term markets using the pe10 ratio and using a 200 moving day average to time entry points. Occasionally I will also indulge in naked speculation and I favour buying the vanguard euro fund when it moves through its 200 mda. Sounds like you have quite an interesting strategy on the go there. I should have mentioned that I also hold some cash in my SIPP as well as my ISA. I didn't mention it as it is only there in readiness for my next purchase and not for the generation of interest. I don't use my SIPP or ISA as a means of tactical allocation through going to cash unlike yourself. - You mentioned you moved out of gilts as you thought the premium was too high yet also mention that you don't understand the price drivers. What did you read or analyse that made you jump? I personally, don't do any tactical allocation when it comes to gilts and always stay fully invested. My "gilts" mainly contain NS&I Index inked Savings Certificates and Index Linked Gilts. - What are your thoughts on residential property? How long have you held for? As you've probably read I don't yet even own a residential property as my home and instead continue to rent. I do own "property" through ETF's and funds however to the tune of around 10% of my total portfolio and cover the UK and Europe. Personally I feel property is over priced but I'm still trying to understand what really drives this market and understand if it really is "over priced" - manipulation, prices or affordability are three drivers I'm trying to understand. As I posted here http://www.retirementinvestingtoday.com/2012/06/uk-house-affordability.html I'm starting to think it is predominantly affordability. - Interesting you use a combination of PE10, 200dma and naked speculation. I'd be interested in how you combine the three. For example, do you combine these into a metric of some description? I toyed with the 200dma here http://www.retirementinvestingtoday.com/2010/05/bulls-bears-and-200-day-moving-average.html and proved I was hopeless at naked speculation here http://www.retirementinvestingtoday.com/2010/05/investing-mistakes-ive-made-shorting.html so now stay with purely mechanical decision making. - PE10 is something we do have in common and is the only metric I use for the tactical portion of my asset allocation. I use the US, UK and AUS PE10's personally. I'd be very interested in which and how you use them exactly? - Do you compare yourself against a relative benchmark and how are you performing? Personally, I benchmark against a simple UK Bonds and Equities benchmark which is rebalanced annually. If I can't beat something that takes 10 minutes to administer yearly then I am clearly wasting my time. So far I'm ahead but I continue to monitor it closely. I hope you stick around and continue to comment as I post on the various elements you mentioned. It is exactly your comments that made me start this blog. A place where I share my retirement investing strategy and thoughts on the economy with like minded people sharing theirs. I hold about half of my assets in cash, earning an average 3.28% gross interest. A good portion of this is to act as reservoir from which to draw for the purpose of steady equity purchase over the next 5 years. Rates are not great but, given the above average cash returns over the past 30 years, I think it's likely that they will stay subdued for quite a while. To get 3.28% I'm assuming you are doing more than just holding in an instant access account? I seem to remember you were tinkering with Zopa. Are you still having success with this? It's instant access plus term deposits, not including Zopa (which I still do) or ILSCs. I was lucky to find a 2 year term at 4.2% a while ago before it was rapidly withdrawn.